The upper part of the shell, which is also known as the carapace, is high and dome-shaped. It is usually brownish or black in color and marked by a contrasting pattern of yellow or orange lines, spots and patches. The skin color is variable but is usually brown or black accompanied with red, white, orange or yellow streaks and spots. In some areas, the males have blue spots on their skin. The carapace is attached to a hinged plastron (under side of the shell). 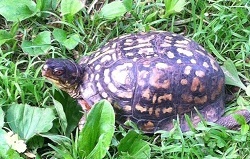 The hinged mechanism allows the Eastern Box turtle to close its shell complete when it is attacked or feels threatened. Even if the shell is damaged, it has the capacity to grow back – just like a human nail! Male turtles have red eyes while the females have brown eyes. 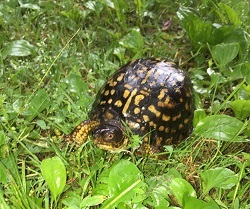 Eastern box turtles are small in size – the length of their body ranges between 4.5 to 6 inches with the occasional individual growing up to 7 inches. However, despite their little stature, they can live up to an incredible 100 years in the wild! 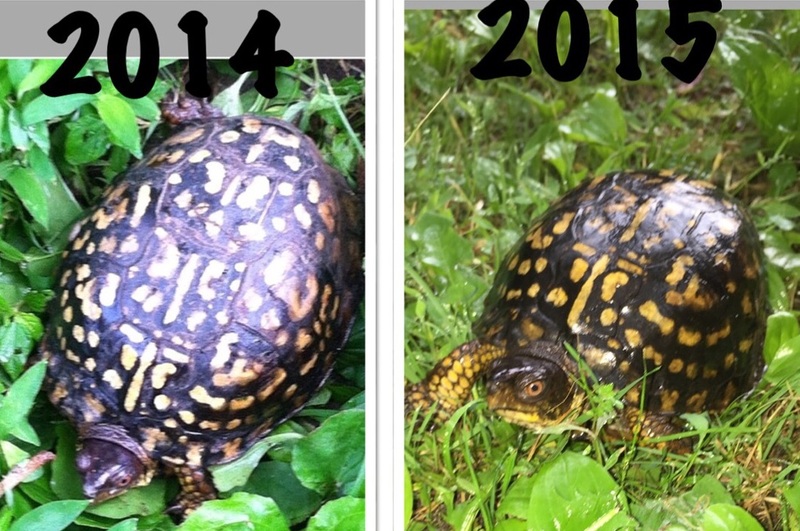 Where is the Eastern Box Turtle Found? As the name implies, these turtles are found in the Eastern part of the USA. They are land turtles, and even though they sometimes like to take baths in shallow ponds or streams, they can drown if the water is too deep. These turtles can remain submerged in mud for many days and they do this if the weather gets too hot. They like moist, flat bottom forests and grasslands and usually don’t prefer steep hills and ridges. The Easter Box Turtle is the state reptile of North Carolina and Tennessee. What is the diet of the Eastern Box Turtle? Just like humans, different individuals have different tastes! On the whole, diet is heavily influenced by surroundings and weather. It consists of flowers, earthworms, fruits, slugs, beetles, caterpillars, mushrooms, carrion, grass, grubs and even bread. Eastern Box turtles eat eggs and hamburgers in captivity but they should not be fed these foods since they are harmful to their health. If there is no food, the turtles just reduce their activity levels and go to sleep in their shells until food becomes available! Often, pet turtles are malnourished – they do not get all the nutrients that are vital to their growth and survival. Pet turtles need a balanced diet of live prey and fruits, mushrooms, berries and greens to stay healthy. They may be fed wet dog food on occasion. Even though they have a very long life-span in the wild, these turtles can die in just a few days in captivity if their needs are not met properly. Many people are under the impression their color fades with age – this is not true. The color fades because captive turtles do not get sufficient exposure to sunlight. These turtles need a humid environment and like warm temperatures. They also require full spectrum UV lighting as this is similar to natural sunlight. Eastern Box Turtles thrive best when they have access to a shallow bath of water. A basking area is also critical, especially for the sexual development of both males and females. 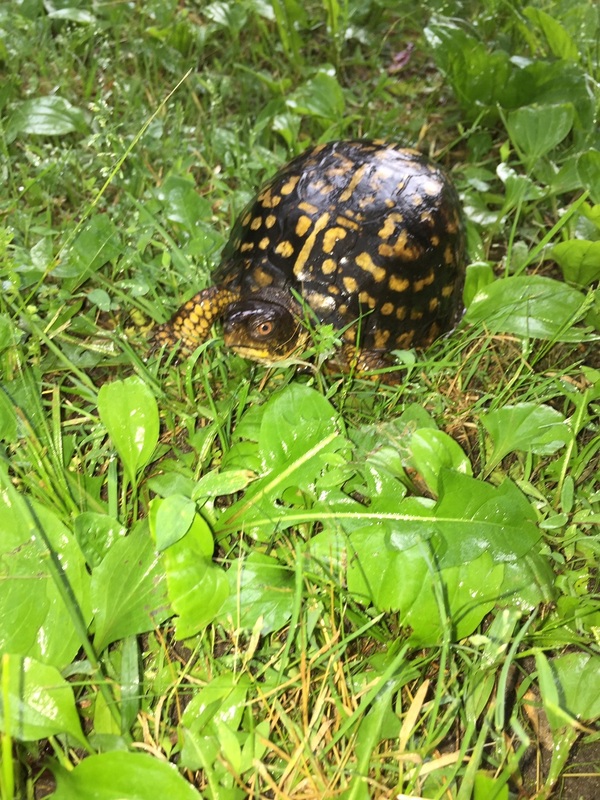 If they are well taken care of, Eastern Box turtles make very good pets – the black and yellow contrast makes them look very exotic and they have awesome personalities! The International Union for Conservation of Nature has classified Eastern Box turtles as vulnerable. These turtles crawl slowly and they are slow breeders, producing very few offspring every year. Human activity such as farming and construction is a major factor in the decline of their population. Please ensure that the turtles being bought by you are either bred in captivity or sourced responsibly. Remember that these amazing animals are not a toy; they can live for many decades and hence you have to be ready for a long term commitment.